Doc Mock’s Movie Mausoleum » Blog Archive » Doc Mock Now Available On iTunes! Plus, An All New LIVE Show This Friday, September 18th! 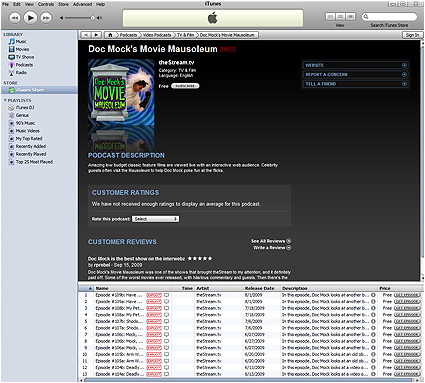 Doc Mock Now Available On iTunes! Plus, An All New LIVE Show This Friday, September 18th! In other news, Doc Mock’s Movie Mausoleum returns this week with an all new LIVE episode on Friday, September 18th at 10pm PST / 1am EST, so make sure to clear your schedules for some Friday night fun! Amanda Sitko, a hilarious improviser from the Upright Citizens Brigade, will be appearing as my guest as we watch a movie made to lambaste your lives! If you missed our last episode before the long network break, now’s the perfect chance to get caught up on it before this Friday! The Doc finally got a lady guest…lookin’ forward to this!